The track leading to the well house. 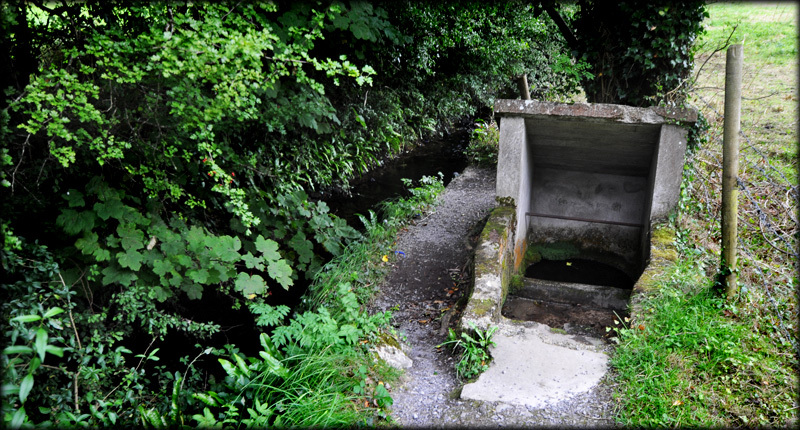 After visiting Abbeyshrule we decided to visit St Columbkille's Well in Ratharney. The well is situated on a track along the side of a fast flowing stream. It is a natural spring, but unfortunately a very unattractive concrete well house has been constructed over the spring. 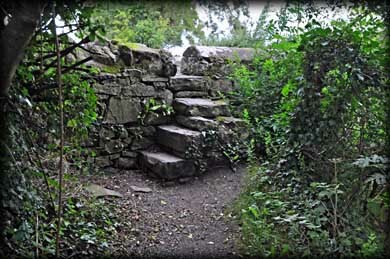 Access is via a stone wall and a short walk along the track. I have since read about the existence of a second well also dedicated to Columbkille situated to the right between the stone steps and the well house. It is a water logged depression surrounded by small boulders, which sounds more attractive than the first well. It may have been hidden in the undergrowth during our visit. Situated: From Edgeworthstown head southwest on the N55 for 9 kilometres. Turn right and go 4.6 k. Turn left for Legan. The well is 30 metres up here on the right. Discovery Map 34: N 2323 6139. Last visit Sept 2012.